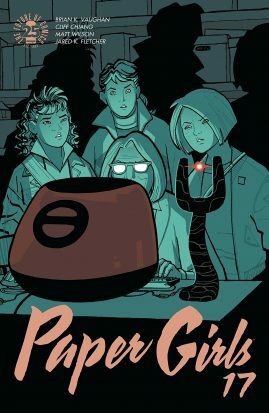 Paper Girls keeps up its newly set pace in the second issue of its Y2K arc, and delivers more much-desired answers about the main storyline. Most of the info about the War of the Ages (snappy title!) 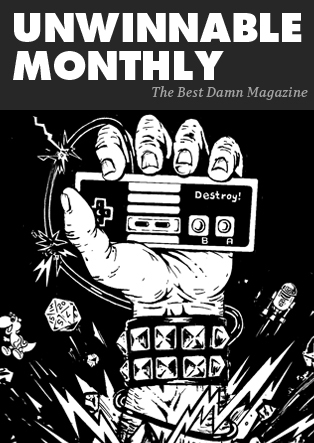 is given via Charlotte Spachefski, the cartoonist and journalist we met at the end of the last issue. I like to use the expository, “info-dump” issues as a yardstick for measuring the skill of any given book’s team, and Vaughan, Chiang, and colorist Matt Wilson are high on the scoresheet. I often see information being doled out in panels with long word balloons and incongruous action going on beneath them. I’m just not sure any two people would be yapping so much in the middle of a firefight, you know? I’m a much bigger fan of the way Vaughan keeps the conversation naturalistic. There’s probably no one more explain-y than a writer or journalist, present company included, so it makes sense that Charlotte would essentially sit the kids down for story time. Chiang does a great job keeping the visuals engaging by switching the focus from faces to hands to newspaper clippings and back around again. Matt Wilson’s color work is exemplary during this sequence, too. KJ is holding a flashlight and pointing it towards Charlotte as she explains things, which puts the girls in the dark and makes the storyteller the illuminated one. The panels switch from blue to yellow, which keeps each page from looking at all monotonous. Charlotte also makes a nice Quantum Leap reference that of course our band of eighties kids doesn’t get at all. It’s a great moment, both because it’s a wink to us from Vaughan and because Chiang gets to draw an excellent adults-are-weird moment as Mac, Erin, and KJ stare blankly up at her. All this focus on chatter is not to say there isn’t some satisfying action in the chapter, though. Tiffany is still separated from the rest of the group, and trying to (literally) put out fires as two giant robots battle directly above her. She also manages to make it to her family’s house in this timeline, and finds herself face-to-face with a new character I can’t wait to get to know better. Her face in the final panel is priceless. Adults are weird. When I heard Ghüs was coming back for the last issue of the arc, I prepared myself for the worst, knowing how much the Saga team likes to obliterate what few strands of hope the main characters have managed to hang on to throughout this godawful space war. But my favorite seal is safe! And, even happy?! 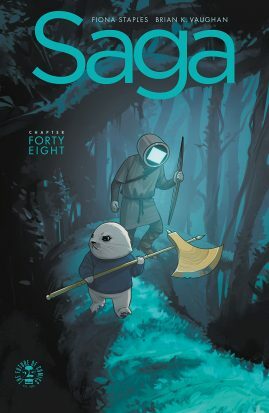 Saga indeed bucks its own trend in this arc-ending issue (the series will also be on hiatus until February 2018) by giving us a warmer chapter focused on family – the one we’re born into and the one we make as we travel on this unpredictable trip called life. It focuses on Squire, the son of antagonist-turned-ally Prince Robot IV. He’s been raised alone by Ghüs, and throughout the hunting trip the two take together, the effects of that nurturing relationship are on full display. I had always thought of Ghüs as a kid, somehow, not just because of his size and adorable puppy-like features (seals are the doggos of the sea! ), but because his folksy wisdom and good heart seemed like they could only come from a naturally young innocence. Now that I’ve seen him with his ward, I can see just how fierce of a protector he is and how committed he is to teaching Squire what he needs to learn to survive, both mentally and physically. Squire and Ghüs get into some heavy subjects as they trudge through the woods, and between Squire’s affected speech pattern – it’s a lot like Prince Robot IV’s – and his inability to strike the killing blow at the critical point in the hunt, we see a classic juxtaposition of nature vs. nurture. Not that Ghüs can’t effectively hunt animals himself, but Squire shows a hesitance to kill any living thing that probably wouldn’t have developed if he was still traveling across war-torn planets with his father. The issue ends with a surprising reunion of most of the cast of main characters, and Hazel’s narration reveals that Squire eventually becomes a brother to her. It’s a welcome upswing in a series that doesn’t shy away from the despair of war, and while I’m sure it’s bound not to last long, I’m glad our scrappy family gets at least of moment of respite.